What do you need to know to keep your network secure? 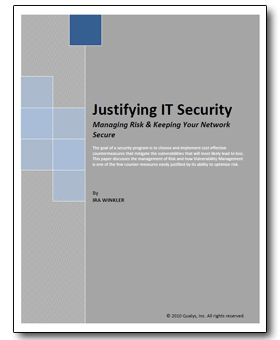 This free white paper from Qualys and author Ira Winkler defines risk and security, presenting security as a synonym of risk management. Using this new outlook on security, Winkler goes on to describe exactly how your organization can invest in an IT security system that will optimize risk, since eliminating risk is impossible. Read on to discover how vulnerability management systems justify themselves by optimizing risk to your network.